So you want to create a no-lawn front garden? As a garden designer, I’ve noticed a growing trend over the past few years: more and more people are wanting to replace their unused, water chugging, labor intensive front lawn with a beautiful low-water, low-maintenance garden. These days it seems no-lawn gardens make up about 75% of my business. The remaining 25% are people who’d like to remove their front lawn but aren’t quite sure what to do once it’s gone. Therefore, I thought it might be helpful if I show a few before and after photos of a new garden’s progress in the hopes it inspires you to re-think your front lawn! Oh, how I wish I had the ‘Before-when-I-first-drove-up’ picture! You would’ve seen a very typical straight cement pathway (complete with cracks) leading directly from the sidewalk to the front door. While the lawn wasn’t huge, it also wasn’t used – EVER. Well, that’s not entirely true. The only time anyone used the lawn was when walking to the gate on the side of the house. So, after removing the lawn we installed a side path that would not only serve a functional purpose but would provide a much nicer experience as you strolled through the garden. You’ll also notice the main path approaches the front door from the driveway, which is not only functional but also divides the front garden into three distinct spaces. More views of the side pathway, interplanted with ‘Elfin’ thyme (which lies very flat to the ground and doesn’t bunch up like many of the other thymes can do). While the main path is mortared, the side path is casually set within the garden, inviting one to enter at a leisurely pace and enjoy the experience! View of the garden from the front of the house. As you can see, one of the main colors of this garden is gold, adding a sense of brightness and excitement. Since gold is a warm-toned color, it looks particularly rich against the grays and greens of the nearby hardscaping and other plantings. 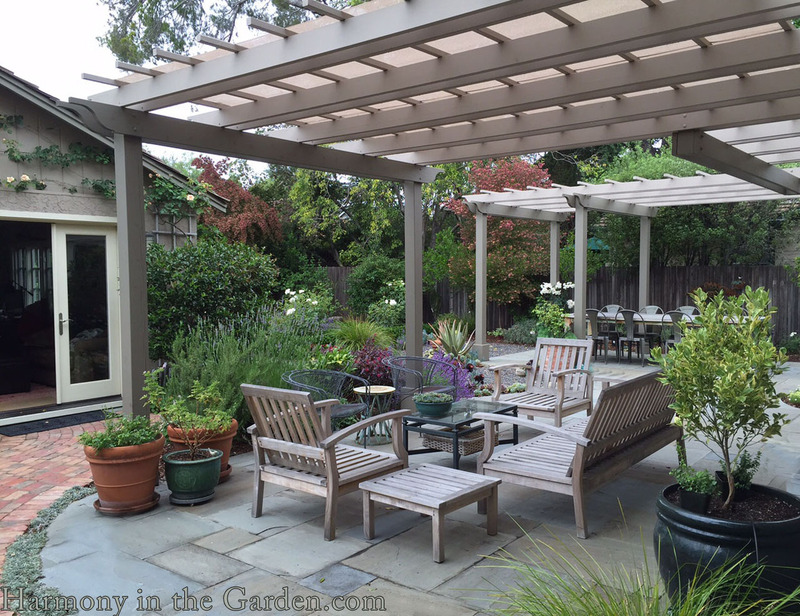 One of the main challenges of this garden was the large tree in the center planting area. The tree’s roots made it almost impossible to plant anything deeper than a few inches, as well as the roots stealing much needed water and nutrients from the nearby plants. As a result, nothing ever thrived in this area. Until we raised the soil level, that is. To raise the soil level just a bit one of my favorite methods is to install half-circles of stone. I’m not a fan of planting beds that have their borders lined with stones as they tend to look a little contrived. Instead, I prefer creating half-circle shapes that are inside the bed – a few feet from the edge of the planting area. After you finish placing the stones, bury them by 1/3 so they look like they’ve been there for a long time versus just plopped down on the ground. These stones now allow you to add several inches of soil for your new plants, as well as add varying height and interest to an otherwise flat space. Here’s a tip: by placing a plant near the end of the half-circle, you blur the beginning and end points which allow the stones to ‘quietly disappear’ into the bed, and creating a more natural look. And now for the close-ups…. When using a lot of gold in the garden its important to temper the brightness by including plenty of complementary colors, such as the lavender color of the nepeta’s flowers and the blue of the succulents. These colors visually ‘cool down’ the hot tones, providing much needed contrast and interest. California’s native salvia spatheca (Hummingbird Sage) is another long blooming favorite. As the name implies, its magenta spires are a magnet for hordes of hummingbirds. The majestic spires grow up to a 18″ high, and whenever I pass by I can’t help running my hand along them. Every time I do, my hand ends up lightly coated with a smooth and silky substance similar to hand lotion. The steely blue blades of the helictotrichon sempervirens (Blue Oat Grass) repeat the shape of the nearby phormium ‘Maori Maiden‘. The drastically different sizes and colors, however, allow them to remain distinctly unique. The cooling blue tones are a welcome site in this brightly colored garden. The bright leaves of the abelia ‘Kaleidescope‘ are repeated with the foliage of coprosma ‘Pink Splendor‘ and yellow flowers of the phlomis fruiticosa. All are very low water, evergreen and tough as nails in our area. The gray-green foliage of nearby nepeta and sedum ‘Autumn Joy‘ provides color contrast as well as fall-blooming flowers. Even the pot on the front porch sports brightly colored agapanthus ‘Gold Strike‘, repeating the foliage shapes and colors in the planting area behind. The container, however, is a cooling shade of dark gray, blending in with the colors of the home and pathway. For more information on removing your front lawn and other design ideas, please read Susan Morrison’s review of Reimagining the California Lawn. 34 Responses to So you want to create a no-lawn front garden? I agree – in fact, we did include rosemary, lemon and lime thyme throughout her garden. It’s rare that I design a garden without an herb or two! Please show a photo of what you did around the FRONT of the Tree. I love the idea of the semi circle of stones around the back of the Tree to raise the soil level for plants. What did you do with the Tree (and its Roots) on the side near the Sidewalk? I have a City owned Tree, 60 years old with a well established root system, all around the Tree Trunk. There is 1.5-2 feet of plantable (?) soil in the front of it. The city owns the first 5 feet “in” from the Sidewalk. And the Tree (Camphor and everygreen) is their property. Anna – I’ll try and see if I have any photos of the very front of the tree and send them to your email address. There wasn’t much we could do as it butts up right next to the sidewalk with a wicked ‘drop’. Luckily (or unluckily) the roots make it so dense that the soil doesn’t erode when it rains! very beautiful!! I just love a good before and after! are there any other blogs that you would recomend for good before and afters? i hope this beautiful garden and post emboldens others to rip out their water-hogging lawns! from what i have been seeing lately, lawn-free gardens almost always turn out so much more interesting and lower maintenance, too. love all your creative ideas! Well, Janine, I know the neighbors across the street removed their front lawn last year, too! Let’s see if it catches on! I love your designs. I specially like the idea of half circle rocks in the middle. Thanks for sharing. Thanks for the compliment, Laura. I appreciate it! Awesome work! Suddenly the space does’t look sad and forlorn anymore. A beautiful example of going lawnless and dividing the space with functional walkways. Like your other readers, I’m loving that half circle of stones set inside the bed. I’ll remember that solution! Love this Rebecca. Your designs are so comfortable and inviting. We got rid of our spit of grass right after we moved to our Denver home and now 4 neighbors have done the same. For me, gardening is so much more fun without grass… esp. in smaller spaces. Nepeta is now the fave plant in the hood! I love this carefree plant!!! Sheila – I’m glad you feel this garden is comfortable and inviting as those are the two words that describe the homeowner to a tee! Hopefully her neighbors will catch on like yours did – lawns in this neighborhood are pretty small and useless (especially with the giant tree roots that they all have). What a timely post. We have an ‘abandoned’ lawn in the front that we’ve let go, but our plan is to plant it with something more aesthetically pleasing. The only trouble is, the septic leach field runs right under it. As such, I’m going to have become more well versed with the roots of plants, than their tops! I think providing we avoid trees, and large deep-rooted shrubs, we should be ok. Keeping to more herbaceous perennials. I’d hate to make a costly mistake though. Have you had to contend with leach fields in lawnless front garden design Rebecca? I’d hate to just plant gravel, that seems so uninspired compared to these beautiful examples. Curbstone – I don’t have any personal experience with leach fields but would imagine you definitely wouldn’t want to plant trees or deep-rooted giant shrubby plants. I’ve seen gorgeous gardens planted over them so I’m pretty sure your options are wide open if you avoid the obvious (like Willows – yikes!!) Have you posted this question on Facebook? If not, tag me and I’ll try and send it out as well…I’d be curious to see what everyone says! Great ideas! Thanks for including the plant names. We are working on our grass but have a large section that will end up being mulched and converted to a no-lawn garden. This was inspiring. Thanks Paige – when you’re finished I’d love to see photos of your garden! Wow, the Cinderella of gardens! What a transformation. I love how the Blue Oat Grasses work with everything else. Also love that loose design of the side pathway with the thyme…does that grow well in shade? I would like to steal that idea! Hi Robin – I have ‘Elfin’ thyme growing in dappled shade and it’s really, really happy. Typically thyme prefers full sun, but you might give it a try! I also have a pathway like this with baby tears growing (a little too rampantly at the moment) and its in the full shade. But those little ‘tears’ tend to fry once our summer hits and things warm up…. Looking mighty sharp! Great job Rebecca, and I love the fluidity of the design. What type of grass was it you removed? Turf removal can be problematic in Austin, especially with the dreaded Bermuda. What a great front garden transformation. Thanks ESP! What kind of grass? Oh, a mixture of 25-year old fescues and weeds and whatnot. Removed it over a period of months then laid down a thick layer of mulch (no weedcloth, though). It’s been a little over a year now and no grass has come through (knock on wood). Glad you like the design!! Wow Rebecca- this is gorgeous! That is one lucky homeowner!!! Rebecca, this front yard is gorgeous. Thanks for sharing your design prowess–I love the half-circles created by the small boulders. Definitely going to remember that one! I bow. Love love love … and the half-circle of stones! What a great solution; completely integrated! YAY! Thanks Ivette – I have lots more that are in their infancy. Can’t wait for the gardens to mature a bit so I can show them off, too! XXOO to you, TOO!